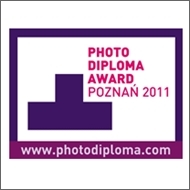 PHOTO DIPLOMA AWARD POZNAN 2011 is a new international competition with the objective to showcase and promote the best BA and MA diploma works in photography. Accomplaying the 7th Biennale of Photography in Poznan, acknowledged as one of the most important photography events in Poland, the competition gives the participants an opportunity to show their work to the public and professionals – curators, critics, and gallery owners. Take the chance to be a part of a great exhibition and meet young photographers from all around the world and be the one who presents the solo exhibition during the 8th Biennale of Photography in Poznan!